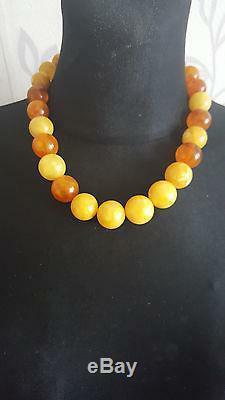 Amber Antique Egg Yolk Butterscotch Colour Natural Baltic Amber Necklace. Stunning real amber necklace with certificate! Made of 100% natural baltic amber. Tested in salt water - not sink; tested in Uv light - glow white; tested in acetone-not harm surface. Each bead is 16-120 mm in diameter. Please note that colors and saturation may slightly vary from originals - monitor's setting can affect them too. Please DO NOT send your item back in an envelope as this raises the risk of damage or loss and we are unable to be held responsible for the item in cases like this. INTERNATIONAL BUYERS - PLEASE NOTE. 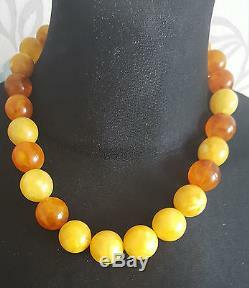 The item "ANTIQUE NATURAL BALTIC AMBER EGG YOLK BUTTERSCOTCH BEADS NECKLACE 78 GRAMS" is in sale since Saturday, March 19, 2016. This item is in the category "Jewelry & Watches\Loose Diamonds & Gemstones\Loose Gemstones\Amber". The seller is "daxas18" and is located in Vilnius, Vilnius.